This post’s meaning of reminiscent falls in to the category: memoirs. 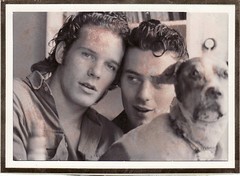 The photo was taken by Janice, the sister of my then-girlfriend Mireille and it portrays me, my brother Joost and our stuffed dog. My brother and I got the stuffed dog at the auction house we worked at, we were in our very early 20s at the time and we lived in a small apartment in the Bestormingstraat, Antwerp, which we rented for very cheap, about 100 Eur per month. We used to put the dog outside on the window sill of our apartment, people thought it was real dog and sometimes signaled us that we had accidentally forgotten our dog “outside” on our second-floor apartment. This entry was posted in hauntology, life on April 10, 2008 by jahsonic. I don’t just reminisce about my childhood – I am re-living it, only better! Great story,before I read the text I thought I was going to be exposed to another world music /obscure euro classic. What I am trying to say,without being insulting is that the picture conveys an 80’s pop aesthetic. The influence of hair gel.Discuss 1200 words? Where is the dog? still on the windowsill? or perfectly matched with a gramophone for a Nipper tableaux? Regarding your 6,186 readers Mr Sonic , there is an old UK Acid House/Rave maxim. I saw Lalo Schiffrin at the Barbican last night and it rocked, you speak with passion about film and music,any insights into soundtracks? Thanks Scott, I liked writing doing something a bit more “personal”. … 80’s pop aesthetic. :definitely! Soundtracks: a very interesting music segment, and something I try to document as much as possible whenever I include a film in my wiki.